Locally-produced ceramics are the most ubiquitous find on archaeological sites in East Africa and their study offers the potential to develop a robust understanding of activity and interaction within and between sites. 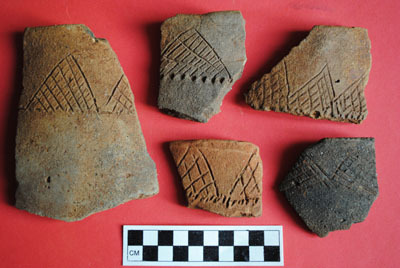 In particular, understandings of the Iron Age societies that developed on the East African coast and its hinterland have been transformed by exploration of a particular group of vessels known as Early Tana Tradition or Triangular-Incised Ware. During the late first millennium, c. AD 600 - 900, sites across East Africa were united by the production and use of these ceramics, consisting of necked jars with incised decoration and a series of other jar and bowl forms in varying quantities. The Ceramics and Society project sought to explore this corpus of Early Tana Tradition ceramics, creating a database of sherds from excavated sites across the region. The history of research in East Africa has resulted in a very diverse set of methodologies and analytical systems being applied to different sites, and through systematic comparison Ceramics and Society sought to bring these data into a common framework for comparison. In a project funded by the British Academy and the British Institute in Eastern Africa, a series of key ETT/TIW sites were revisited, and sherds analysed according to a single system, allowing quantitative cross-site comparison for the first time. A data paper about this archive is available at: Wynne-Jones, S., & Fleisher, J. (2013). Ceramics and Society: Early Tana Tradition and the Swahili Coast (Data Paper). Internet Archaeology, (35). Council for British Archaeology. doi: 10.11141/ia.35.7.